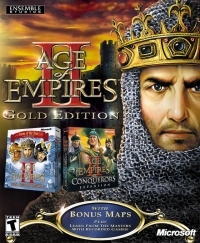 Description: Age of Empires II Gold Edition contains the Age of Empires II: The Age of Kings game as well as the Age of Empires II: The Conquerors expansion pack. This is a list of VGCollect users who have Age of Empires II - Gold Edition in their Collection. This is a list of VGCollect users who have Age of Empires II - Gold Edition in their Sell List. This is a list of VGCollect users who have Age of Empires II - Gold Edition in their Wish List.